Soldering in electronics is a method of joining components permanently to a printed circuit board (PCB). An alloy of tin and lead called solder (63% tin and 37% lead), is normally used to ‘metallurgically’ bind a component pin/leg to the copper track of a circuit. Some modern solders do not contain lead, due to environmental concerns and its potential toxic nature. Lead is poisonous under certain circumstances. 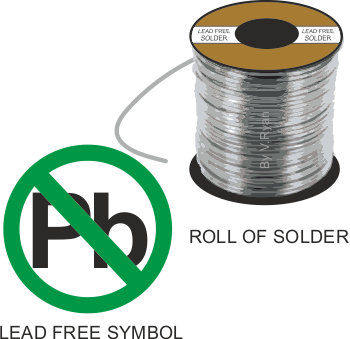 However, lead free solders require a higher melting point, as they have an increased tin content. This sometimes means replacing existing soldering equipment with equipment that is capable of operating at higher temperatures. When soldering, the ideal finish to the soldered joint, is a ‘concave fillet’ (example seen below). This can only be achieved if the soldering iron is at the right temperature, it has been in contact with both the copper track and component pin/leg for the right length of time and the PCB tracks have been cleaned properly, removing all the oxide on the surface. The soldering seen below is poor. The tracks of the PCB have not been cleaned with wire wool or a PCB eraser before soldering. The oxidation that has taken place on the copper tracks, has prevented a proper joint. Although the finished joint looks quite good, the solder has not penetrated the copper track. It is unlikely that the circuit will work. 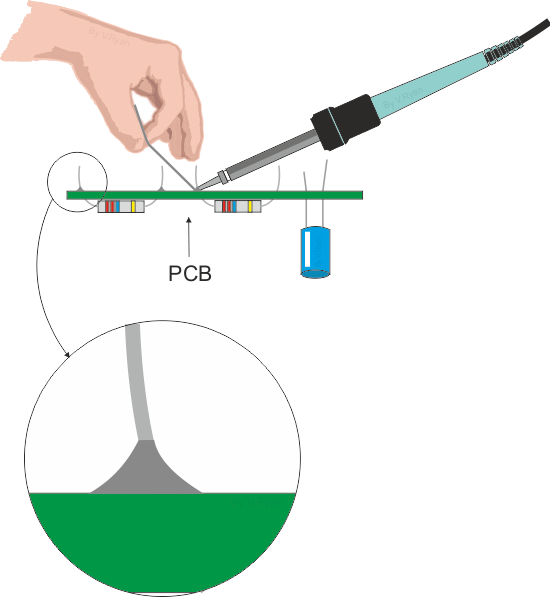 The soldering below has metallurgically joined the components to the PCB. However, it looks ‘messy’ and suggests more practice soldering is required. The soldering iron has been held for too long against the track and the component and consequently too much solder has been used. It is possible that some of the components have been subject to too much heat from the soldering iron and they may have been damaged. There is still a possibility that the circuit will work. This is a typical error when soldering electronic components. The solder as jumped across a gap between tracks, joining the two component pins/legs. The circuit will not work. 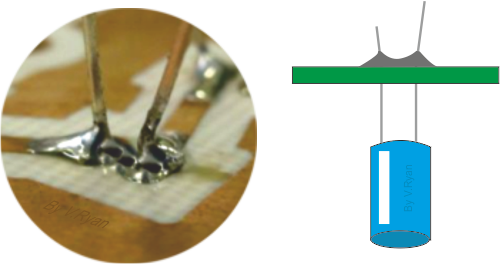 When soldering the pins of a component, try to position the soldering iron so that it only touches the copper track and component pin that need soldering together. A good set of solder joints is seen below. The soldering iron has been held against both the component pins and the copper track, ensuring a good joint. The right amount of solder has been used, at the right temperature, with the soldering iron applied for the correct length of time. When setting fitting components to a PCB board, do not press down the pins / wires as seen opposite. 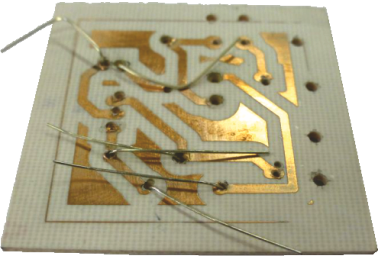 When soldering is attempted, the solder will inevitably follow the pins / wire, joining components and jumping across the gaps in the copper tracks. The result will be a ‘destroyed’ circuit. It will probably be impossible to correct, as so much solder will have been used and so many tracks joined together.